Offering you a complete choice of products which include pvc coated conveyor belt, pvc conveyor belt repair services, pvc endless conveyor belt, rough top conveyor belts, pvc conveyor belt and pvc sidewall - cleated conveyor belts. These belts are used for light duty applications. PVC coated conveyor belts are used in various industries like Packing , pharmaceutical industries and food processing industries etc. Specific Problem/Issue Length reduction or addition. 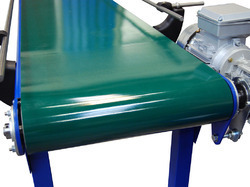 We have gained years of experience and in-depth knowledge in manufacturing, supplying, trading and distributing a comprehensive range of PVC Conveyor Belts. To assure about the quality, we stringently check all the belts on certain well-define parameters. We also provide customization as per the specifications laid down by the customers to meet their expectations. Being a quality conscious organization, we are engaged in manufacturing, supplying, trading and distributing an array of PVC Conveyor Belt. All the belts are designed and manufactured using high-grade material and modern tools that are obtained from the reliable vendors available in the market. We also pack our belts using quality material to ensure safety during transportation. 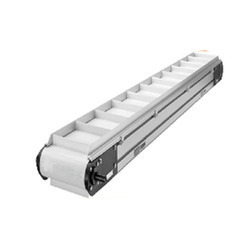 PVC Conveyor Belt with Side Wall & Cleats that is manufactured using high quality Raw materials. 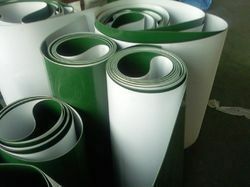 PVC can be available in white and green color. 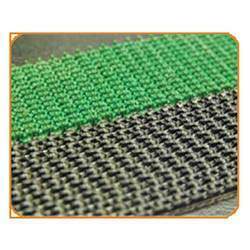 We Offer these belts in various sizes and shapes as per client Requirement.